Haslingden had a town workhouse situated on Spring Lane dating from 1749. It could accommodate up to 150 inmates and in 1837 its governor was Henry Rothwell who received a salary of £14 a year. The site was later occupied by the Haslingden brewery. There was also a workhouse for up to 200 inmates at "Newchurch" — actually at Mitchell Field Nook, Waggoner Tunstead, on a site now occupied by housing. The governor here in 1837 was John Howarth at £19 a year. The inmates in these early workhouses were employed in handloom weaving. Mitchell Field Nook site, 2006. Lancashire: New Accrington (3), Old Accrington, Higher Booths (2), Lower Booths; Coupe Lench, New Hall Hey and Hall-Carr; Henheads; Haslingden (4), Musbury, New Church (3), Tottington Higher End. The population falling within the union at the 1831 census had been 35,304 with parishes and townships ranging in size from Henheads (population 202) to New Church (9,196) and Haslingden itself (7,776). Like many northern unions, Haslingden was unenthusiastic about operating the New Poor Law. Its first Board of Guardians minutes were not recorded until June 1838, some 18 months after formation of the union. Attendance at meetings was also desultory — in their first year of office between Jun 1838 and June 1839, the average attendance at board meetings of the 18 total Guardians was 4. There were sometimes as few as zero, and the higher attendances often coincided with dates when the meetings were at the Commercial Inn rather than at the Haslingden National School! Initially, the union rented the existing workhouses at Spring Lane and Newchurch. The administration of these establishments fell considerably short of official requirements: classification and segregation were poor, and inmates wore their own clothes and were allowed to smoke. New arrivals at Haslingden workhouse were first placed in the kitchen before being taken to the wash-house and washed in a tub. From 1851, Haslingden workhouse was used only for male inmates while females were sent to Newchurch. The workhouse matron at Newchurch in 1856 was Mrs Richard Ashworth. In 1864, the Haslingden Guardians asked the Lancashire and Yorkshire Railway for permission to place collecting boxes at local railway stations, so that which travellers could donate discarded books and periodicals. The Guardians appear to have been surprised when told that one was full - in 1872. One box was still in use at Bacup station in 1919! A rise in inmate numbers, together with continuing pressure from the Poor Law Board, led to the erection in 1868-9 of a new union workhouse at Higher Pikelaw, midway between Haslingden and Rawtenstall. It was designed by Henry F Lockwood and William Mawson who were the architects of a number of northern workhouses including those at Barnsley, Bradford, Carlisle, Dewsbury, North Bierley and Penistone. The Haslingden site, which was 900 feet above sea-level, is shown on the 1909 map below. 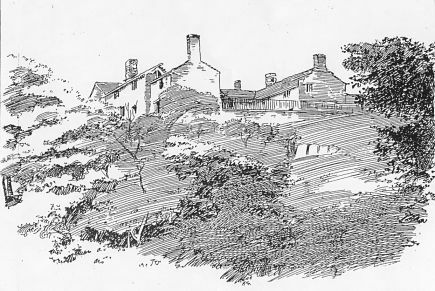 Haslingden workhouse from the east, c.1905. The workhouse had a T-shaped main block facing to the south east. Haslingden main block from the east, 2001. Haslingden dining-hall and rear of main block from the north, 2001. A block at the north-east of the main building contained the board-room and porter's lodge. Haslingden board-room and porter's lodge from the west, 2001. An 88-bed infirmary lay at the south of the site. 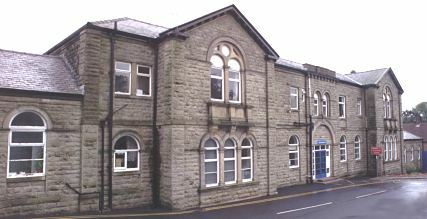 Haslingden original infirmary from the north-east, 2001. DECREASE OF PAUPERISM IN HASLINGDEN UNION. The fortnightly meeting of Haslingden Board of Guardians was held on Wednesday, at the Union Workhouse, Pikelaw. Present - Messrs. J. Kenyon (in the chair), J. Duxbury, D. Tunks, H. G. Cunliffe, R. Ormerod, J. Ashworth (Waterfoot), James Taylor, John Taylor, L. Halliwell, R. Ingham, R. Hargreaves, J. Ashworth (Rawtenstall), E. Oddie,J. C. Witham, J. Collinge, N. Worsley, T. Parker; Mr. John Woodcock, solicitor, acting-clerk; and Mr. Bryant, deputy-clerk. Mr. Henley, Local Government Inspector, was also present. £ s d No. Amount. THE CONDITION OF THE WORKHOUSE, AND THE STATE OF PAUPERISM. He was glad to see that in the infirmary the Guardians had appointed another nurse. That, he thought, was an absolute necessity, for 95 patients were more than one woman could look after. Taking the infirmary throughout it was in excellent order He had received no complaints, and the people seemed well taken care of. He thought it would be of advantage if, in the future, the Guardians had under consideration the provision of extra accommodation, that some day rooms should be provided, so that the dormitories might be cleared of their patients, who were able to be removed, during the day. No doubt the small rooms had originally been intended for day rooms, but necessity had required their being turned into dormitories, and it was most desirable that the latter should be cleared out during the day. As one alternative he suggested the class of persons who were permanent invalids from old age should be transferred from the infirmary to some of the wards in the workhouse, which should be used as an overflow from the infirmary. That would relieve some of the rooms in the infirmary. Another alternative was that if they did build any addition to the infirmary they should provide day rooms for those people who could get out of bed. In ordinary hospitals they seldom had any day rooms, but they had a much larger space for each patient and per bed, and these people only remained in the hospital for a limited time, and were discharged when recovered, whereas at the workhouse infirmary they had to deal with poor infirm people who would remain there until they died. He also recommended that some suitable provision should be made for getting the inmates out if fire unfortunately broke out. It was not a matter of the destruction of property, but a question of saving life. He did not see how with one staircase in each wing these people could be got to. It generally happened in a workhouse, as in other places, that fire broke out in the basement, and that the smoke and flames rose to the upper story, preventing people coming down. Somebody would have to carry these weak and infirm people down. Whether they could be safely put down a shoot - for they could not very well be carried down ladders - he would leave for practical men to decide. But certainly some way of escape should be provided. It was the policy of the Local Government Board that their inspectors should interfere with the Guardians as little as possible, and should assist in carrying out the duties so that no friction should arise. If any inspector caused any friction between the Guardians and the Local Government Board, he would be very much to blame. He had omitted to congratulate the Guardians on the state of pauperism in Lancashire as compared with the rest of England. The average for the whole of England was as one to 40; in Lancashire it was one to 61, and in Haslingden Union one to 16. These figures spoke for themselves. Whether this was owing to the better state of the population or better administration, or to a combination of both, he was unable to say, but the fact remained. 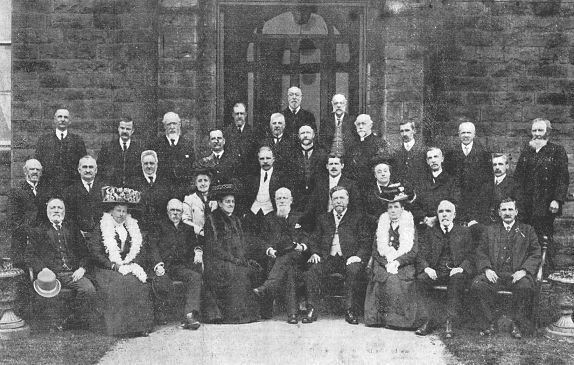 The Haslingden Board of Guardians, 1910. There are 326 inmates within the Workhouse walls, made up of old men and women; young men and women, and boys and girls. One hundred lie on the sick beds of the Infirmary; 72 are imbeciles or idiots, of whom 48 are females; 29 are boys, and 24 are girls, with five infants under two years of age. There are fathers and mothers here; grandfathers and grandmothers, and even great grandfathers and great grandmothers. Since Mr. and Mrs. Robert Brown were appointed the master, and matron in 1893 I have only visited the house twice, my last inspection, being one afternoon last week, and which happened to be under very pleasing circumstances. Mr. Brown has seen the workhouse grow, having come to it as a carpenter in 1868, and a better selection to succeed Mr. Hay, and Miss Hay (who became matron on the death of Mrs. Hay) could not have been made. I have seen enough to lead me to the conclusion that Mr. Brown is respected, and even loved from the youngest child to the oldest inmate, and his intelligent and considerate care for the poor unfortunates is shared in by his wife and daughter, Miss Brown, a very able assistant. A remark of Mrs. Brown as an old woman walked up the yard that "Old Sarah" had been in the house the longest, having been an inmate of the old workhouse at Haslingden, carried my memory back to that very primitive workhouse, and to the times when, "Old Sammy" Spencer, like a ministering angel, distributed tobacco and snuff and small coins at 'Xmas time, and, when Mr. R. Munn was chairman of the Board. The difference between the old workhouse and the new is almost as great as between the old one-storeyed cottage and a palace. In the early sixties, I think, there were only about seventy inmates, and these were, huddled into some small rooms, near the Haslingden Parish Church, which were formerly used as handloom weaving shops. There were all sorts of cases, very stuffy, rooms, bad ventilation, and next to no classification. Baxter's brewery now stands on the site of the old workhouse. The new workhouse at Pike Law, which was opened in 1870, is a fine architectural structure, elevated on the west side of the Rossendale Valley, of which it commands a full view. It is built of stone, with a couple of minarets or bell-like domes on the summit, and forms a conspicuous attraction to passengers on the railway, the tramway, or on foot. The boardroom, the porter's room, and relief rooms are erected on the north side of the house, and the infirmary is on the south side, so that the house itself stands back in the quadrangle, the fourth part of which is composed of grass plots, front yards, and the carriage drive and boundary wall, the space between the boundary wall and carriage drive being planted with trees and well grassed. The main entrance to the workhouse is by a flight of stone steps leading into the entrance hall, which has a very agreeable appearance, the walls being painted and decorated with pictures. A few steps lead into the main aisle, which runs from end to end of the building, and the different rooms for the inmates are on each, side. A similar corridor divides the bedrooms in the second storey. Two or three steps more lead into another corridor, branching from which are the master and matron's private room, the kitchen, and the, dining hall, a spacious room, which is lighted by a row of windows at the west end and all along the north end. When visiting [the workhouse] last week the afternoon was fine, but very much overcast, and the inmates received quite an unexpected and to them marvellous treat. Mr. John Duckworth, one of the now Accrington Guardians, and his wife, and Mr. and Mrs. Fawbert, also of Accrington, were on a tour of inspection. Mr Duckworth had brought with him his phonograph, and I attached, myself to hint to see how the inmates received an entertainment from Edison's wonderful invention. It was Mr. Duckworth's idea to give an entertainment in every room, but I suggested the advisability of trying the instrument in the dining room so that if acted the inmates in bulk, young and old, could have the entertainment after tea, or supper, as they call it, which is served at a quarter to six. We went into the room to try the experiment, and placed the phonograph on the harmonium. There were two old men in the room, one placing the broad, another who seemed to be deafish, doing ditto with spoons, and knives. On Mr. Duckworth starting the machine the man with the bread, who was about the middle of the room, stopped short, with astonishment, and seemed for a moment literally transfixed with the slice of bread in his hand. As the song proceeded I went towards him, and was astonished to find that the phonograph was heard to better advantage than I had ever heard the instrument in any other place. The sound was even better at the far end of the room, and Mr Duckworth was greatly pleased. I asked the old man what he thought of it, and he replied, "Do you want to mek all the lunies leet?" (Do you want to make all the lunatics light in their heads). Jack and I laughed, and the old man asked whose invention is was. When he was told Edison, the American, he remarked that those Americans were wonderfully sharp fellows. This old man said he had been in the house seven years, as he was unable longer to work in a cotton mill. More than pleased will the experiment the instrument was conveyed to the old women's room which overlooks the front grounds, and is well lighted, with numerous windows, each containing flowering plants or shrubs, grown in the workhouse greenhouses. As you enter here you cannot fail to be struck with the neatness of everything. The floor, are as well scrubbed as a kitchen table top; the twelve cots are neatly tucked up, with a blue coverlet on the top with the name of the Haslingden Union and year thrown up in white. There were eleven old women here, and as the little instrument was carried into the room and placed on a table near the fireplace, curiosity was aroused. Some wanted to know if it was a new fangled clock, and when the funnel cane to view, they said it was suggestive of beer brewing, and spiced ale at 'Xmas time. When the funnel was fixed on the phonograph, one said it was a coffee mill. A band selection happened to be on the roller, and the sensation it caused the old people is not likely to be soon forgotten by those who witnessed it. The old lady, who was darning stockings in the other corner of the room put them down, and the eleven old women in the adjoining room also came trouping in to learn where the music was coming from. One was reading, but dropped her book. How they all smiled and laughed and wondered. Some even said they could dance to it. Next came a comic song; and then a song with a chorus "Waste not, want not," seemed to please immensely. One old lady pointed out to me as the oldest in the room, and who had been sitting on her chair, and chucklingly right merrily to herself, now rose and examined the "thing," as they called it, and pronounced it wonderful. Another old lady pulled off her white cap and bent her ear over the trumpet to catch every sound. The old woman comes from Accrington, and is 86, and the youngest in this room was 64. If this group could only have been photographed in the positions they assumed the photo would have been worth treasuring. "Nothing too good for the Irish" brought a clapping of hands by an Irish woman, and "Shure it's moighty wonderful." Later on when this woman had returned to the other room, and Mr. Brown and his lady visitors entered she showed with pride the rosary of chain and beads which Father Dillon had given her, and assured him that she prayed for him and everyone of them "Ivery blessed day." These old women seemed quite content, and looked very neat in their striped gowns, which were not all of one pattern, white caps, and grey woollen shoulder shawls. Inquiring from one of them as to the vacant bed I learned that there had been a death the previous week. The old women were very profuse in their thanks to Mr. Duckworth for his treat. A major expansion of the site to the north-east of the workhouse began in 1912 with the opening of a new infirmary to the north-east of the workhouse. Haslingden new infirmary from the south, c.1929. By the 1920s, the Haslingden Union had established children's cottage homes known as Moorland Cottages on Sandown Road, Haslingden. The homes could accommodate up to 40 children. The property is now in private residential use. Lancashire Record Office, Bow Lane, Preston, Lancashire, PR1 2RE. Holdings comprise: Guardians' Minute Book (1838-1910); Guardians' Minute Book (Printed, 1907-30); Workhouse Committee Minute Books (1865-70); Letter Books (Poor Law Board - 1838-1902); Letter Books (Local Government Board - 1880-92); Lists of Guardians and Officers (1839-1921); Valuations (1880-82); Miscellaneous Deeds (1703-1829); Sub-Committees' Minute Books (1906-1914); Infirmary Committee Minute Books (1898-1905); Visiting Committee Report Books (1914-19); Boarding-Out Committee Minute Books (1911-20); Year Books (1904-1929); Overseers' Meeting Minutes (1895-1927); Overseers' Financial Records (1856-1927); Miscellaneous (1924-29). Rhodes Boyson, The Haslingden Poor Law Union 1848-1930 , 1949 (BA Thesis, University of Manchester). Thanks to staff at Rawtenstall Library for their help.